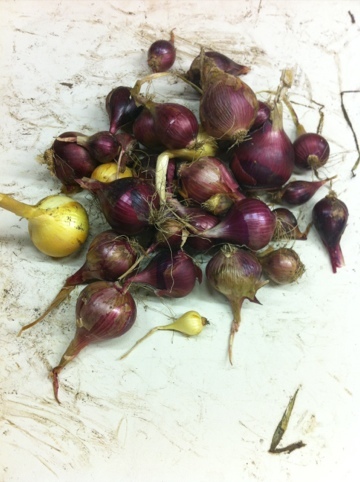 I have just completed my onion harvest for 2011 and by my standards it has been quite a success. Usually by the time I get to harvesting onions they have gone to seed. However the journey to getting to that point can be just as challenging. I usually start with planting my onions from bought seedlings in June (December for those in the Northern hemisphere). I often find that many of them are eaten by slugs and snails, or disturbed by the scratching of the feline menace (cats), so they never even get started. However once they get going I find that onions are fairly tough plants. Apart from some really dedicated snails, there doesn’t seem to be many pests that will impede their growth. You do however need to keep the weeds down as they compete with the onions and will decrease their final size. I tend to have a problem with the onions going to seed before they are fully grown. However I have discovered that even if the onion has gone to seed, once you remove the tough core, the onion can be used as normal. It is just that they won’t keep as long as they normally would. Perhaps a bowl of French onion soup is in order. After harvesting onions you should really let them sit out in the sun for a few days to dry out the outer skins so they keep as long as possible. Then just make sure you store them in the dark where the air can circulate around them so they don’t go mouldy. This entry was posted on Sunday, December 18th, 2011 at 10:19 pm	and is filed under Summer, Vegetables.